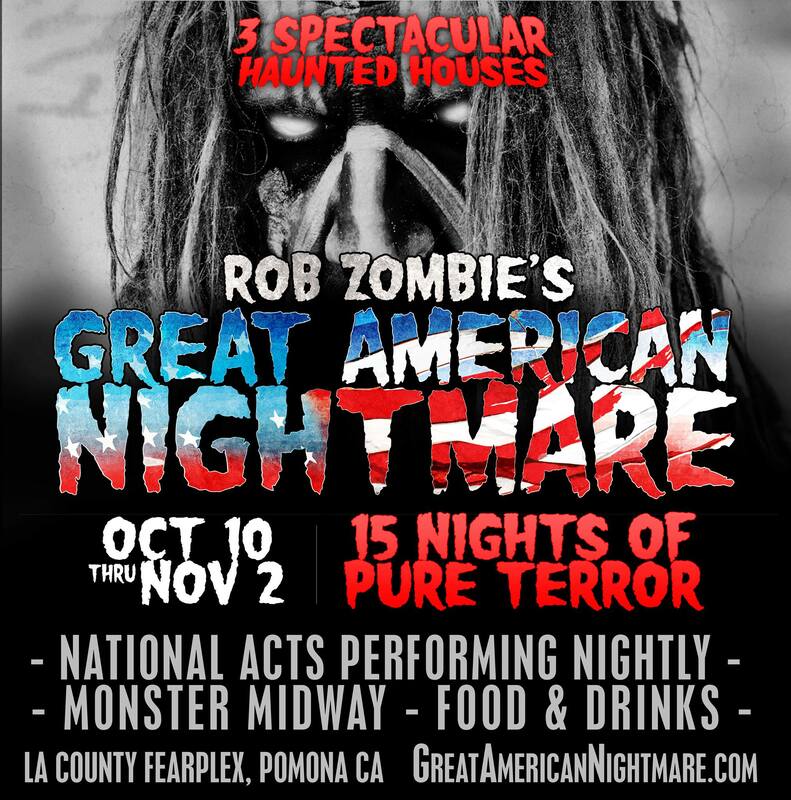 Los Angeles – Are You Ready For Rob Zombie’s ‘Great American Nightmare’? If you live in the Los Angeles area and you need something new and fresh to hit up this Halloween, Rob Zombie has you covered. Yep, that’s right – I said Rob Zombie. Because this year he’s putting together his very first Halloween time extravaganza and it’s called ‘Rob Zombie’s Great American Nightmare‘! 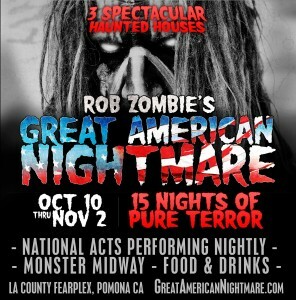 It’s running October 10th through November 2nd in Pomona at the LA County Fairplex….oops….I meant FEARplex. Set up to be a massive hybrid of haunted houses and music, you know to expect nothing less than the best as far as shock factor and overall quality if you’ve ever seen any of Rob Zombie’s concerts. Let’s start with the haunted houses real quick. There will be three and all will obviously have themes based on some of Rob’s movies. First up will be a House Of 1000 Corpses maze called ‘Haunt Of 1000 Corpses‘. 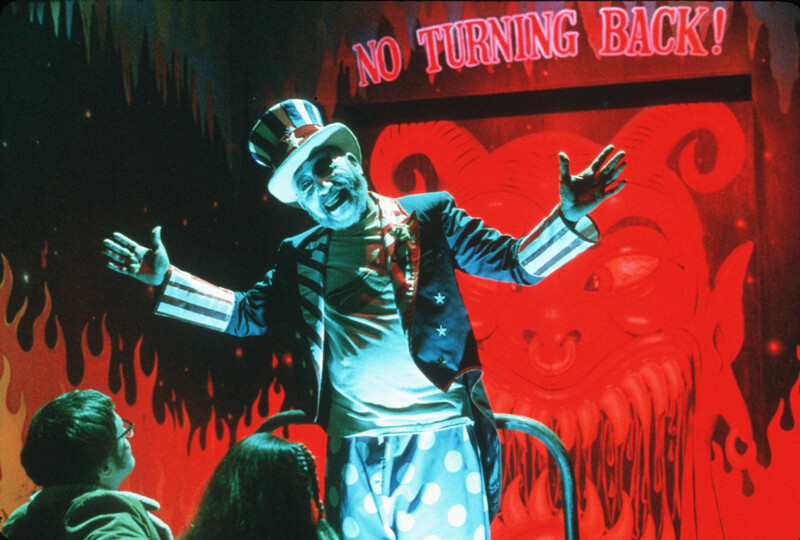 Personally, I really hope they incorporate a lot of the Murder Ride from the movie seeing that Universal’s Halloween Horror Nights already had an amazing attraction a few years back that covered House Of 1000 Corpses and in 3D form. Speaking of 3D, the second haunted house is a bit more obscure as it’s theme will be based on Rob’s animated movie, The Haunted World Of El Superbeasto. Definitely could work with all of the colors and the 3D element mixed in, so I’m excited to check out that one. And the last maze will be based on Rob’s most current movie, The Lords Of Salem, is called ‘Lords Of Salem: Total Black Out‘. Guessing it will rely heavy on the darkness adding to the creep factor. Ok – so we got the haunted houses covered, now let’s talk about the music. This is definitely one of the things that will make the Great American Nightmare stand out from the rest of haunted attractions in the area. Some of the bands scheduled to perform on various nights are: Kottonmouth Kings, 3OH!3, The Used, Butcher Babies, Andrew W.K., Eagles Of Death Metal, and Powerman 5000. And last but not least, Mr. Rob Zombie himself will be taking the stage on the final night of November 2nd! All of the info including tickets, directions, and lineups can be found HERE. Stay tuned for more info and my review too! This entry was posted in News and tagged dirty horror, fearplex pomona, haunted houses, lords of salem haunted house, los angeles haunted houses, news, rob zombie great american nightmare, rob zombie haunted house by Dirty Horror. Bookmark the permalink.